When it comes to writing, there are two main ways of doing it – pantsing vs plotting. Each is a perfectly viable method, depending on the person involved. What works for one doesn’t work for another. Pantsing (or seat-of-your-pants writing) is when a writer has little to no idea of the plot of the story and just sits down and writes, seeing where the story and characters takes them. At the other end of the scale is plotting, where often detailed notes are made before the story has even started, mapping every aspect of it out. You can even do a bit of both, to varying degrees. For examples of plotting there are these two images. That is the plotting done for Catch 22 by Joseph Heller. That one is for The Order of the Phoenix by JK Rowlings. I’ve tried out both styles. Tears of the Mountain was done by plotting – I still have all the noted pinned to a corkboard. The rest have mostly come by pantsing, with some elements of plotting. I may make a few rough notes, but in general, the story goes where it will. Intrigued, I clicked on the video and was met with the following. As always I did a bit of looking up on it, and discovered a bit more. In 1950 in the ancient port city of Ugarit (preset day Syria), a series of clay cuneiform tablets were discovered which contained fragments of noted music, the Hurrian Songs. The most complete was the Hurrian Hymn to Nikkal, or Hymn no 6, the oldest surviving substaitally complete noted music in the world. It turns out that while it is notated, no one can agree as to how exactly to translate it, and their are at least 5 rival, substantially different interpretations of it. Even so, listening to something that may have been played 3400 years ago is an amazing thing. 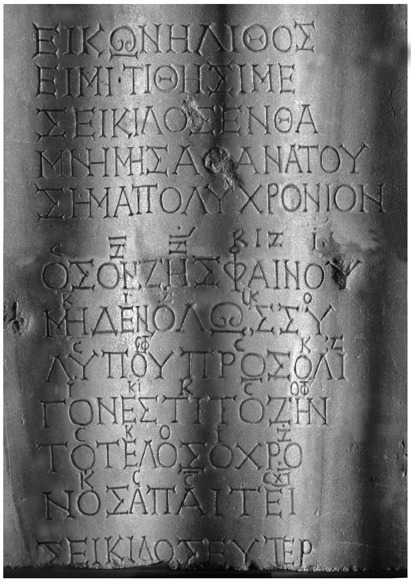 The oldest complete musical composition in the world is the Seikilos Epitath, from somewhere between 200BC and 100 AD. In the image of it, you can see the notations above the lyrics that accompanied it.